Canada’s Military Service Act of 1917 made military enlistment compulsive for men between the ages of 20 and 45. Canada was certainly not the first country during the war to implement compulsive military service; Britain had begun in 1916, and both France and German had maintained large conscript armies since the Franco-Prussian War of the 1870s. In Canada, the Military Service Act is likely best known for exacerbating tensions between the French and English speaking communities in the country, but overall thousands of men of enlistment age asked to be exempted from military service, and many did not even register. The system worked on a series of classes, which divided up men within the acceptable age range in terms of desirability as a soldier. For instance, Class 1 consisted of men over 20 but no older than 34 with no wives or children. Men from Class 1 were called up first; those in the other classes (older men, married men, men with children) would be called up for enlistment as the need arose. Conscripts would be used to reinforce the Canadian Expeditionary Force in France, whose battalions were in increasingly dire need of men as volunteer enlistment dropped off. There were a number of reasons for exemption; working in an exempted industry, conscientious objection based on religious or moral grounds, financial or family hardship, or medical unfitness. Men wishing to be exempted had to appear before a local tribunal, after submitting a claim for exemption, and state their case. If the tribunal deemed it appropriate a certificate of exemption was issued, which the exempted man had to carry with him at all times and be able to produce for any authority that asked for it. Of the first men called up as part of Class 1 in 1917, over 90% applied to be exempted. 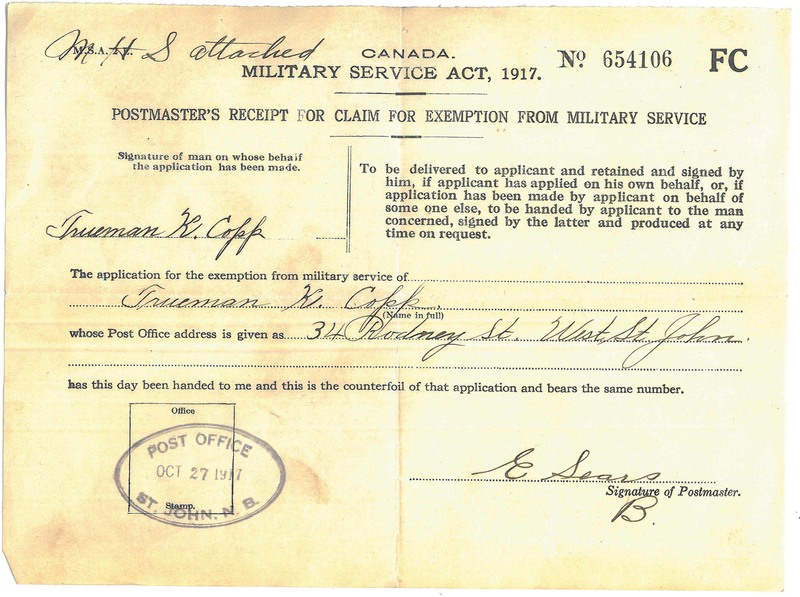 The receipt of claim for exemption shown above was issued to Truman Copp, of St John, New Brunswick. Aged 20, Copp was the son of a farmer who worked with his on the family farm. Since he does not appear as a member of the CEF, we can assume that he was successful in his case for exemption from service. Copp is representative of one of the largest groups of exempted men, farmers, whose work producing the food that supported the army was considered too important for them to go overseas. Before the Military Service Act many farmers kept their sons at home, since they were critical to the function of the farm. Many farmers were highly critical of the Act, as it would take away their primary labour force. By the fall of 1917, Borden’s Union government had adopted an official policy exempting anyone engaged in food production, excluding thousands of young men from the Class 1 division from conscription. However, after continued losses in France in 1918, even farmers were called up, angering rural families and sparking protests across the country. By the end of the First World War, Canada had drafted roughly 100 000 men of the 400 000 who had registered. Of those, just over 24 000 were actually sent to France, and later to Siberia, to reinforce the Canadian Expeditionary Force. Conscripts were viewed by the volunteers in France with disdain, but they went a long way to bolstering the Canadian battalions that would fight during the 100 Days in the summer of 1918. Canada would again begin conscription during the Second World War with the National Resources Mobilisation Act of 1940, drawing on the lessons learned during the First World War. Thank you for this information, both my grand fathers were in the First World War and I appreciate all your help learning more about this important history. Thank you for reading Arlene! Thanks for posting! If anyone is researching WW1 service, and are encountering Regimental numbers, those prefixed ‘213’- tend to be those given to conscripts. Keep the fine work! Thank you very much for the tip. We’re hoping to do more on conscripts in the future, they’re an often ignored element of the force that fought during the 100 Days. How can I tell if my great uncle was a volunteer or was conscripted. He died at Vimy. 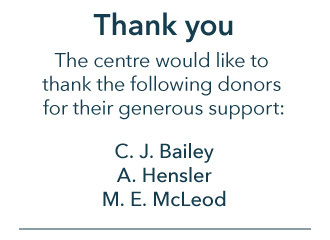 Thank you for getting in touch. Conscription in Canada did not begin until after 29 August 1917, when the Military Service Act came into law, and men who were conscripted were not sent to the front until 1918 for the most part. 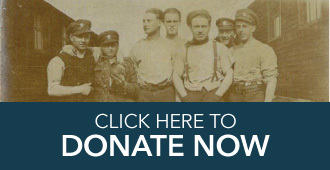 If your uncle died at Vimy, he could not have been conscripted and would have been a volunteer. Full versions of the attestation papers for soldiers fighting with the CEF during the First World War are available through the Library and Archives Canada website, if you wish to learn more about his time with the army. Are the Certificates of Exemption considered part of the service file? My grandfather’s service file is on the Library and Archives website, and there seems to be a serial number which relates to a certificate of exemption (he was supporting his widowed mother and younger sisters.) But there is nothing in the digitized file. Is there any way to find his application (I think the form was quite long from what I could see in the Military Service Act) and the certificate? Would the records have been kept? Thank you for your question. I have never seen a Certificate of Exemption in a service file before, and I am not entirely sure if copies of the application or certificate were archived (though I imagine they must have been). That’s probably a question for the archivists at LAC, they will likely know more. Most exemptions were issued locally; the decision was made by a local court administrator, so they may have ended up in local archives rather than federal ones, but I can’t be sure.